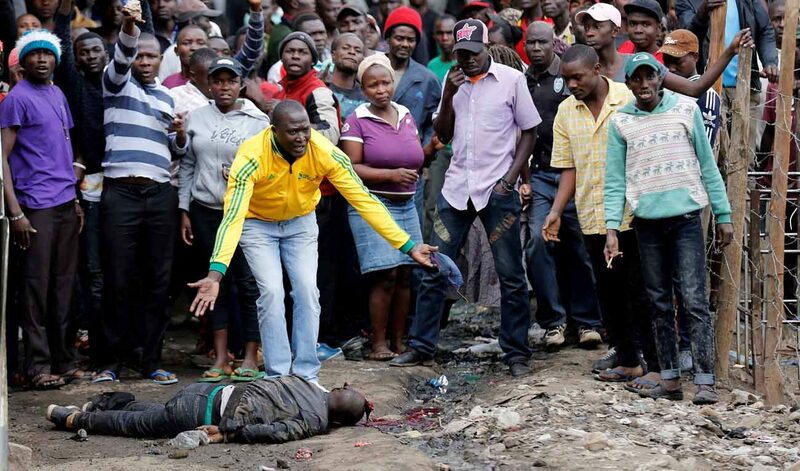 NAIROBI, Kenya (CNS) — Catholic bishops in Kenya called for calm in the East Africa nation, as pockets of violent postelection protests left at least five dead in opposition strongholds. The protests had ignited slums in Nairobi and Kisumu after Raila Odinga, the main opposition candidate, rejected the provisional early results, which showed incumbent President Uhuru Kenyatta had taken an early lead in Aug. 8 voting. “We are saying to the actors (politicians), you were given an opportunity to go around the country; now can you stop and reflect and allow Kenyans to pause as they wait for the results,” said Bishop Alfred Rotich, retired head of the country’s military diocese, at an Aug. 10 news conference. “We need to be calm, we need to be sober … this is moment for peace,” he added. In Eldoret, Bishop Cornelius Arap Korir issued a similar appeal. In some areas, his diocese is still recovering from a deadly postelection violence that occurred 10 years ago. “We urge calm. Those who (are) aggrieved should go to court,” said Bishop Arap Korir. Between Dec. 28, 2007, and Feb. 28, 2008, at least 1,000 people died and 600,000 were displaced from their homes, after President Mwai Kibaki was declared the winner and Odinga rejected the polls as rigged. As votes were counted this year, foreign observers described the election as credible. Thabo Mbeki, former South African president, said the voting process, counting at polling centers and transmission of the results met standards set by Kenya and the African Union. Former U.S. Secretary of State John Kerry said the election’s integrity remained intact, while the European Union observers said candidates should accept that losing is natural. He suggested politicians should be restricted to two-month campaigns and recommended stress relief activities for after elections. Some Catholic Church centers hosted polling stations, using church schools and social halls. Msgr. Wilybard Lagho, vicar general of the Mombasa Archdiocese, said the election commission had approached the church about offering polling stations, and church officials agreed. “It was a weekday, so worship activities were not disrupted,” he said. In some remote regions, the Catholic Church is the only institution with structures that can allow peaceful voting, protection of voting material and of officials.